Due to popular demand, and because perhaps we are insane, we decided to have another Halloween movie marathon this weekend. To go with our new set of movies, we of course needed a new set of treats. This time I went with cookies, since I really am a cookie girl. I made the sugar cookies from The Joy of Vegan Baking. This is my go-to recipe for sugar cookies because it’s pretty straight forward and makes a good amount. They’re not blow you away good, but they’re good and the royal icing is amazing so they make for good party snacks and gifts. Not to mention they’re so much fun to decorate. For a little variety I also tried out the recipe for the chocolate crinkles, since I imagined they’d have a festive look to them. They’re soft and fudgey on the inside, sort of like little brownie bites. I cooked them on the shorter side so they would be softer, but perhaps they would have been nice crunchy. While they were well liked, I wish they were more chocolaty. We were lucky enough to have the lovely FoodEater make us the mac and cheese I’ve been dreaming about. It was so good. I have to admit that I am not a daiya fan but it worked really well in this dish. It was cheesy but did not have the sticky weirdness that daiya can have on pizza. 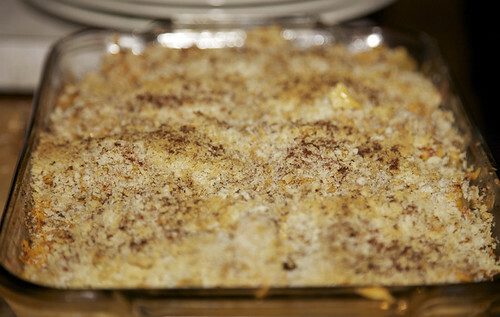 My favorite part was the seasoned bread crumbs on top that gave it more texture and flavor than just standard mac. The whole dish was completely eaten in less than an hour. We learned some very important lessons during this movie marathon: If you go looking for the cat, you will probably die. If you get cats thrown at you, you will definitely die. If you try to kill cats, you may get brutally beaten by the man at the hot dog stand and eaten by rats. Most importantly, Christmas is a very scary holiday. I’ve been less than impressed with the Joy of Vegan Baking except for the caramel popcorn recipe. Your cookies are completely adorable and it’s good to know the royal icing works, though! those are the cutest halloween cookies ever. I agree with Foodeater. I don’t think you’re giving those cookies the credit they deserve. I ate one simply because I found it’s cuteness irresistible… but once I took a bite, HOT DAMN. Those were some freaking delicious cookies! A seriously amazing night all together. Thanks so much! You’re the perfect hosts! I’m so glad you could make it (and that you loved the cookies)! I just totally love these cookies, they look so super cute! 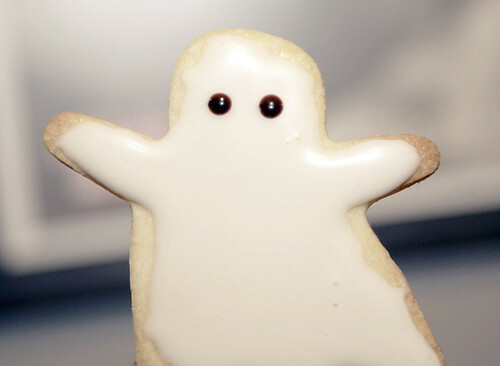 Those ghost cookies are so cute! Very fitting for your blog! Happy Halloween! Cats are not a good thing to have around when the horror starts up, that is for sure! Those ghost cookies are AWESOME! 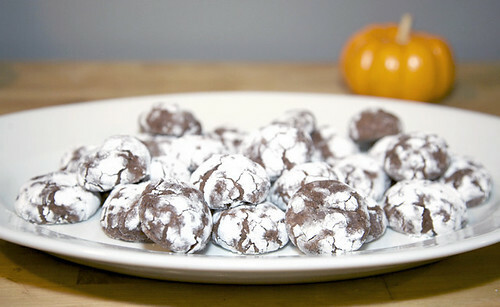 But I think I might devour that whole plate of chocolate crinkles all on my own, they look and sound just delicious. And why haven’t I made mac & cheese in so long? That must change! And my favorite part is always the spicy crunchy bread crumbs on top, too! I LOVE YOUR COOKIES! I haven’t made the sugar cookie recipe, but I *love* that royal icing. It’s so perfect, and sets so well. I want to come to one of your Halloween movie marathons! My sister and I made ghost cookies the other day also. and we make sugar cookies a lot together. Your icing is way neater than ours ever is. this icing recipe is superb. It uses egg replacer so it sets up really well and isn’t too messy. These are the ridiculously cute. Period. I honestly can’t believe how good these ghost cookies are. And darn two full plates of them gone in a couple of hours. So good and so cute. crinkles were yummy too. yes the crinkles are from the joy of vegan baking as well. it’s a pretty good overall cookbook. not every recipe is perfect but many of them are superb. 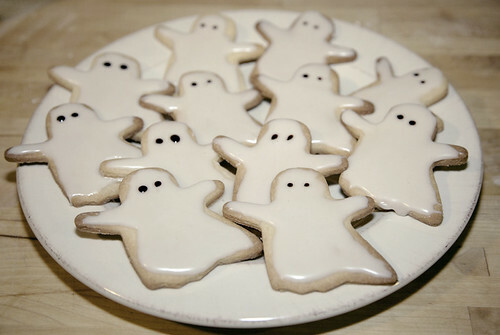 Your ghostie cookies are just too freakin cute! Hard to say how they measure up in cuteness to the ghost cake – it’s sort of like comparing apple cuteness to orange cuteness, no? You can learn important life lessons from horror movies. For instance, when running from a crazed maniac, attics and basements are totally where you should immediately run to, particularly if there is only one entrance to them that is easily blocked. Assuming, of course, that your goal in life is to be murdered by a crazed maniac.